This country was founded by the so-called founding fathers group of self interests. When they wrote those documents,many of them were slave owners and slaughterers of the Indigenous. They did not include blacks, natives or women in the documents and only after their “self-interests” were challenged did they make amendments to the original document. This is called cognitive dissonance. What folks believe to be true really isn’t true at all but they cannot face the fact that they have been duped, so they would rather believe the lie, than face the truth. The trouble is that the lie becomes their reality, a reality that they fight and die for. Maybe it’s the psychological condition of many empires over the ages.. Pulling back the covers of history to reveal the truth of what these Empires were really about will cause a great shock, history is re-written to cover up the shock and keep the masses duped and patriotic about a lie. Then the people wake up and fight back against the lie, then the lie is either doctored, or blamed on mus-interpretation or blame on the “terrorists” who chose to fight the system of lies. After a while a “savior” is born whose puppeteer strings are invisible. This person appears to be able to bring all things together, the people resign to the NWO (which ain’t new at all) and go back to their jobs on the 9-5 slave ship. The artists throughout the ages have always remained on the fringe of this process, and typically are the ones who begin the “stir” again. And the cycle continues. 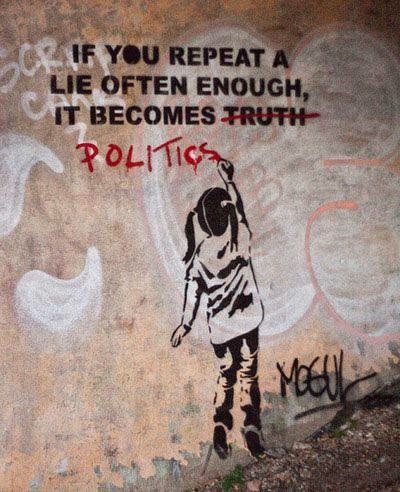 In this modern age, even the artists are challenged to see past the maze of lies and disinformation. But some of them are so doped that they lose credibility, even if they are on point. And so the saga continues. This is a prison planet and you can best believe, there is an extraordinary number of options that have been tried, tested and implemented to keep the prison population in a non-aggressive stupor.